This is the best Banana Bread recipe in the world. The Banana Bread is moist and super easy to make. You don’t even need an electric mixer. It’s super moist because it is made with oil and brown sugar. The additional banana chunks in the bread make it taste super fresh and intense. With optional sugar crust. I show you how to store and freeze your Banana Bread that you can enjoy it as long as possible. Start with combining the flour, baking powder, cinnamon, and salt. Set aside. Then mash or puree the bananas. I prefer pureeing them because it is so much easier and faster. Transfer the bananas to a large mixing bowl and add the brown sugar. Whisk just until combined. Don’t use an electric mixer to make Banana Bread. Slowly add oil while you whisk and stir just to combine. Add eggs, and vanilla and whisk just until incorporated. Then add dry ingredients and stir just to combine. Fold in banana chunks until evenly combined. 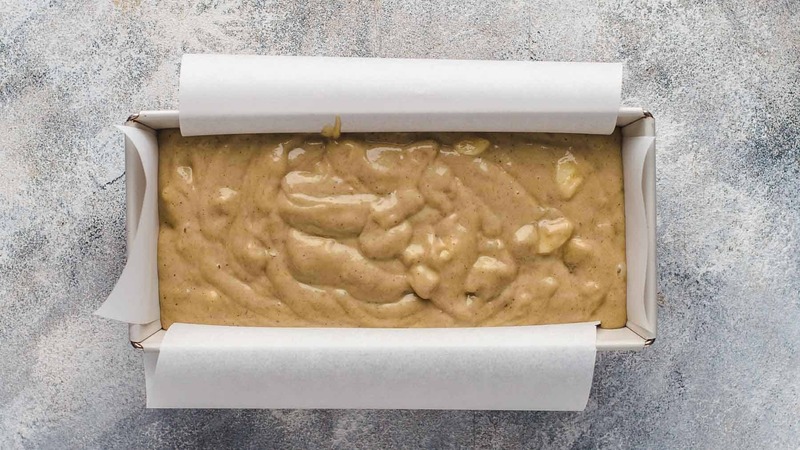 Transfer to a 9×5″ (23x13cm) loaf pan and spread evenly. Top with a halved banana if desired. This is optional but highly recommended. Sprinkle with cinnamon sugar if desired. This is also optional but highly recommended. Bake for 55-65 minutes or until a toothpick in the center comes out clean. Do not overbake the banana bread, or it will get dry. If you are looking for healthy, gluten-free, or vegan Banana Bread, I got you covered. If you go for a healthier version, you might want to skip the crunchy sugar topping as well. Therefore, you could top the Banana Bread with some chopped nuts for extra crunch. Be aware that every substitution will affect the texture of the Banana Bread slightly. How to make Banana Bread moist and fluffy? I highly recommend using a kitchen scale for most accurate results. A cup doesn’t equal a cup, but a gram or an ounce is always a gram or an ounce. Adding too much wet or dry ingredients will change the texture of the baked banana bread completely. Too much flour will make it dry and crumbly. Too much of wet ingredients will make it mushy. If you don’t have a kitchen scale, I recommend buying one. 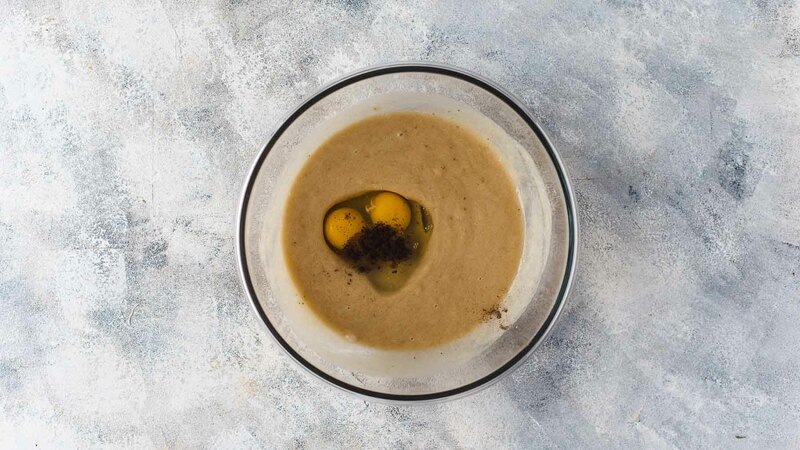 If you don’t want to make the investment and stick to cups, make sure to spoon and level all dry ingredients and don’t overfill the cup with wet ingredients. 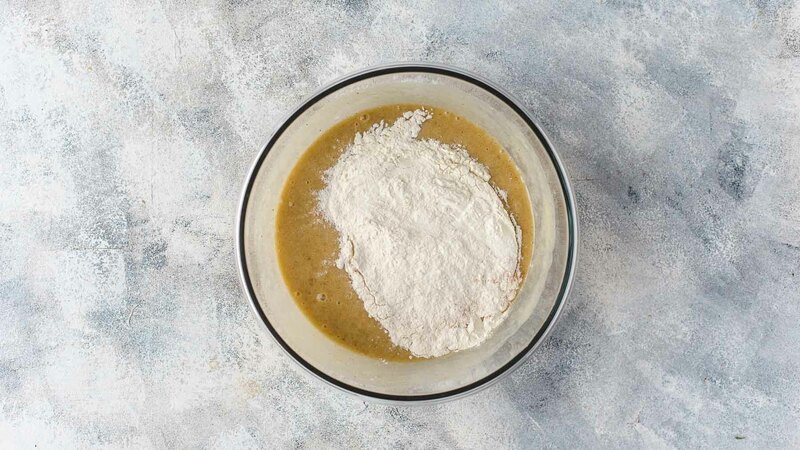 A packed cup of flour is about 1.5 times of spooned and leveled flour. The spoon and level method works like this: Use a tablespoon and spoon the flour into the measuring cup. Level it with the back of a knife. Don’t push the flour into the cup. Although this will bring you the best results if using cups, it’s still not as accurate as measuring with a kitchen scale. When measuring wet ingredients with cups, make sure that you don’t fill it up until it runs over. Fill until almost full that a fingernail would have space between the ingredient and the edge. 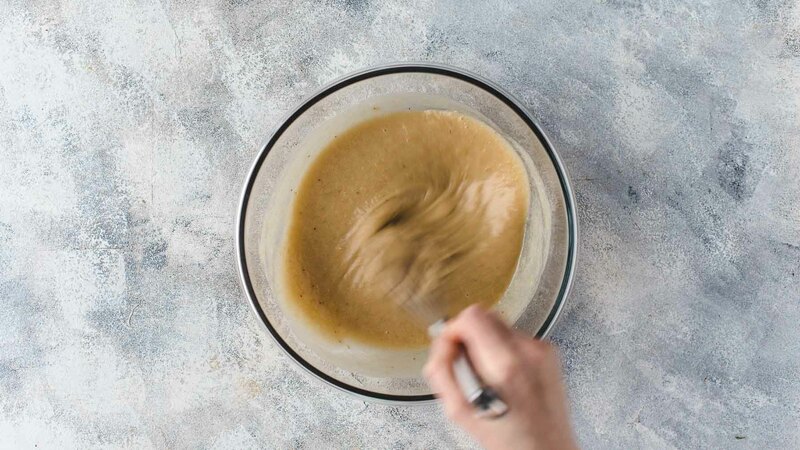 The next secret to ultra moist Banana Bread is whisking the batter by hand. Don’t use an electric mixer. 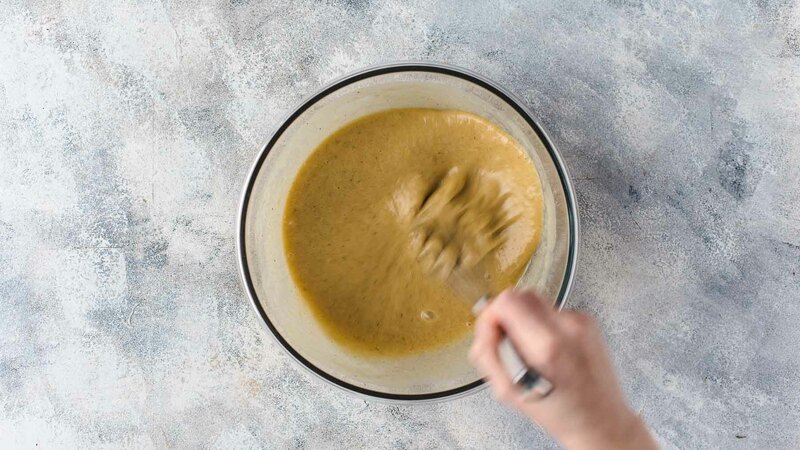 By using an electric mixer, it’s possible to overmix the batter. If you overmix the batter, too much gluten develops in the bread. The result would be a dense and rubbery Banana Bread. So make sure to follow the instruction “whisk just until combined” carefully. The Banana Bread will take about 55-65 minutes until it is done. Because every oven is different, it’s always the best to use a toothpick to check the consistency. The toothpick should come out clean with just a few cake crumbs on it. Use a toothpick which is long enough that you know how the consistency is in the center. Oil contains more fat and less water than butter. So oil makes cakes and also Banana Bread moister than butter because of the high amount of fat. Brown sugar is naturally moist and keeps Banana Bread moister compared to dry white sugar. The whole recipe makes about 19-20 muffins. Just line two 12 muffin pans with cupcake liners and fill the liners between 3/4 to almost full. Bake at 425°F for 5 minutes, then lower the temperature to 350°F and bake additional 11-14 minutes or until a toothpick in the center comes out clean. To make Banana Bread Muffins instead of a loaf is also great if you are looking for a small batch recipe. Simply cut the recipe by half and you will end up with about 9-10 muffins for your next breakfast or dessert. How to store Banana Bread? This Banana Bread recipe keeps well and stays moist up to 3 days when stored in an airtight container at room temperature. Before you transfer it to the container, make sure that the bread is completely cooled. 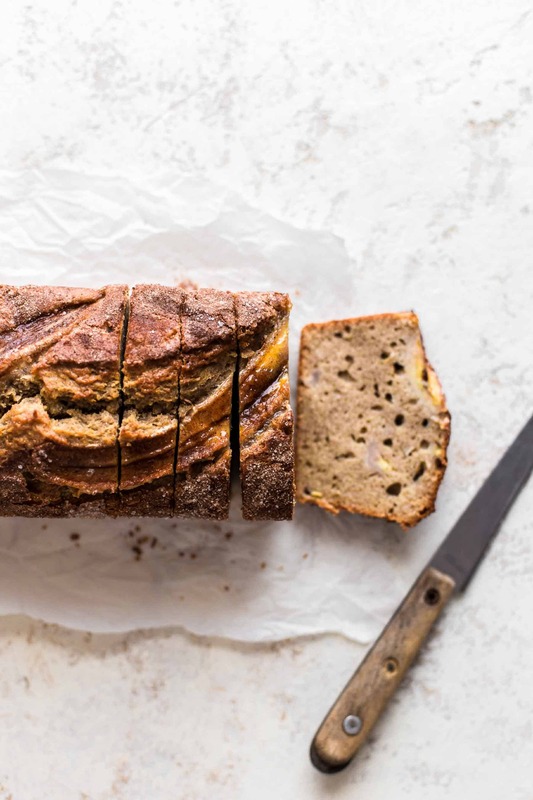 If you enclose the Banana Bread while it is still warm, it will condensate on the surface and mold could form very quickly especially if you top the Banana Bread with the halved banana. If you skip the halved banana on top of the bread, you could further increase shelf live by 1-2 days. 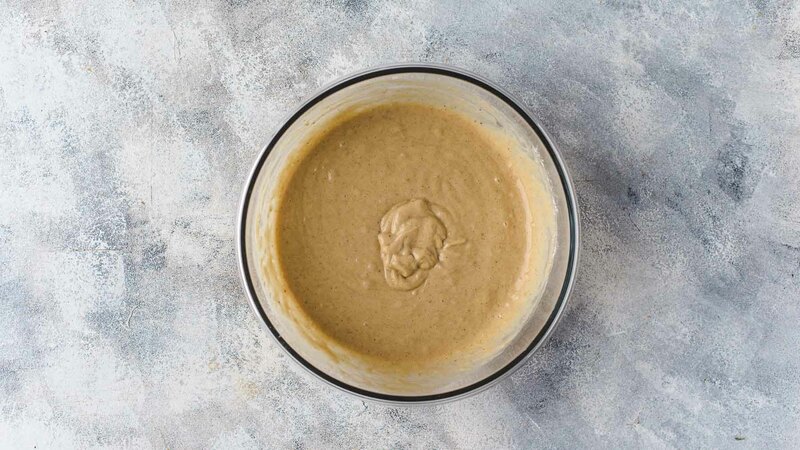 If it is not possible to store it in a cool place at room temperature because it’s hot where you live, you may refrigerate the Banana Bread in an airtight container instead of storing it at room temperature. The same is true for Banana Bread Muffins. Banana Bread is always best eaten fresh. However, if you plan to freeze the whole loaf, let the Banana Bread let cool completely. Then wrap tightly in plastic wrap twice. Then wrap twice in foil. Place the wrapped loaf in a large freezer bag and remove as much air as possible. It freezes well up to 3 months. To thaw, unwrap the loaf, put it on a wire rack, and let stand at room temperature for 3-4 hours. Then transfer to an airtight container. To freeze single slices, tightly wrap each slice in plastic wrap twice. Then place in freezer bags and squeeze out all the air. Slices freeze well up to 1 month. For thawing, unwrap single slices and place uncovered on the counter for 1-2 hours. 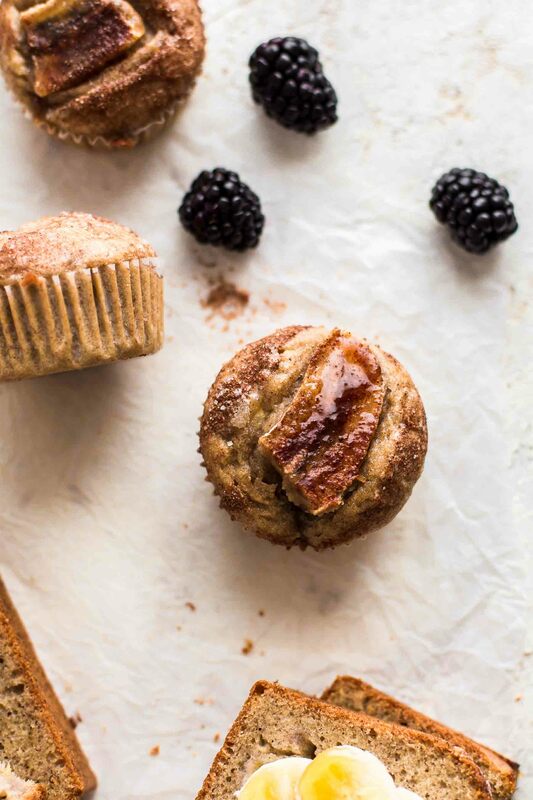 Do the same with Banana Bread Muffins. Note: You may skip the halved banana and the sugar crust if freezing Banana Bread loaf, slices, or muffins. Otherwise, it can get soggy at the top while thawing. However, fresh Banana Bread is always better than a frozen one. I just want to repeat it. 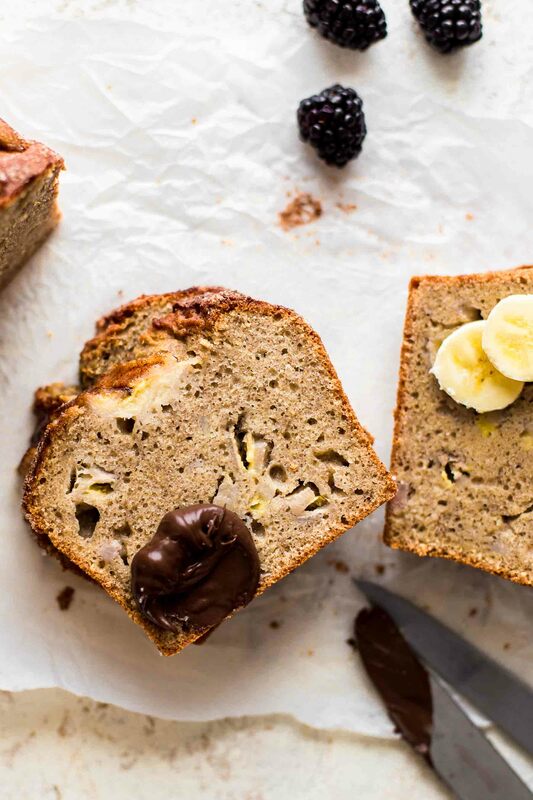 If you make this super moist Banana Bread recipe leave a comment, rate it and tag a photo #alsothecrumbsplease on Instagram! Would love to see your snap! This is the best Banana Bread recipe in the world. The Banana Bread is moist and super easy to make. You don’t even need an electric mixer. It’s super moist because it is made with oil and brown sugar. The additional banana chunks in the bread make it taste super fresh and intense. Preheat oven to 350°F (175°C). Line a 9x5 inch (23x13cm) loaf pan with parchment paper with an overhang around the edges to easily lift the bread out of the pan after baking. In a small bowl, combine flour, baking powder, cinnamon, and salt. Set aside. In a large mixing bowl, using a whisk, whisk mashed bananas and brown sugar just until combined. Slowly whisk in oil just to combine. Add eggs and vanilla and stir just to combine. Add dry ingredients and whisk just until combined. 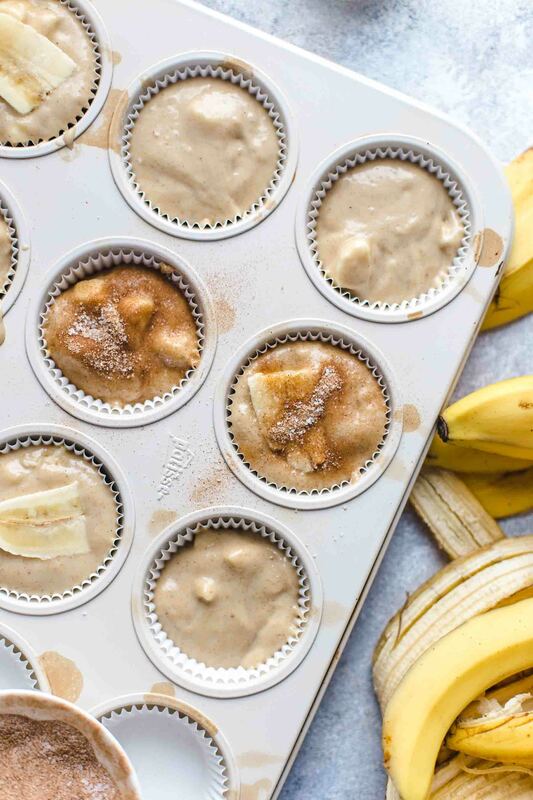 Fold in banana chunks. Transfer batter to the prepared pan. OPTIONAL topping: In a small bowl, combine sugar and cinnamon. 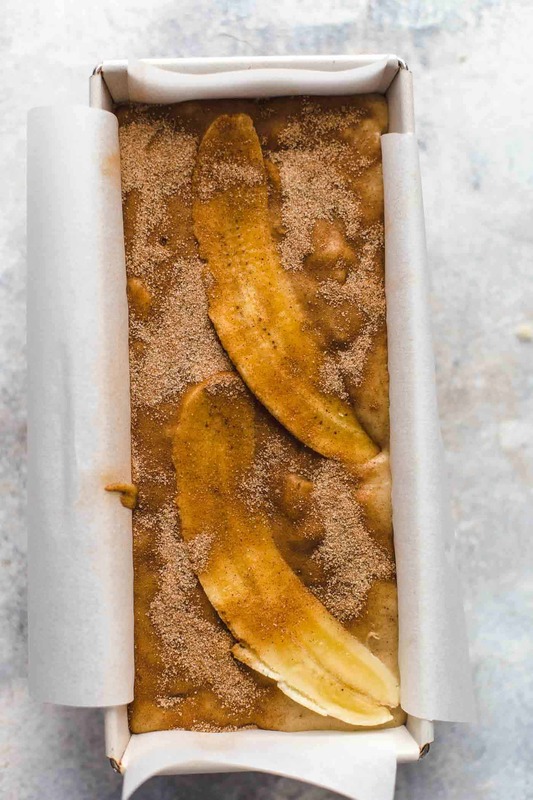 Top batter with halved banana and sprinkle with cinnamon sugar if desired. Bake for 55-65 minutes or until a toothpick in the center comes out clean. Remove from the oven and let cool for 15 minutes. Then remove the banana bread from the pan and transfer to a wire rack to cool completely. Store in an airtight container at room temperature up to 3 days. If you want to make Banana Bread Muffins, line two 12 muffin pans with about 19-20 cupcake liners. Fill liners between 3/4 to almost full. Bake at 425°F / 220°C for 5 minutes. Then lower the temperature to 350°F / 175°C and bake additional 11-14 minutes or until a toothpick in the center comes out clean. Divide recipe in half for 9-10 muffins. 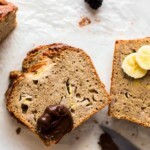 Read the blog post for additional information on how to make, store, and freeze banana bread, how to convert a banana loaf recipe into muffins, and how to make banana bread moist and fluffy. 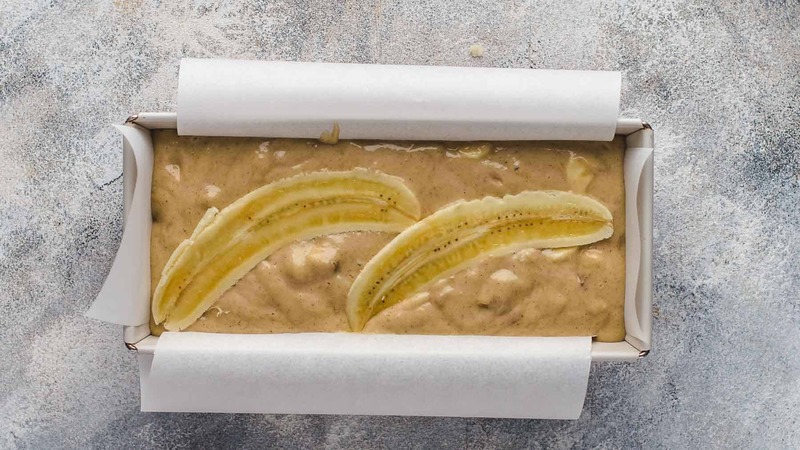 Watch the 1-minute video to see the whole process of making the banana bread. Love Bananabread… I have The recipe with yogurt..
Congrats for the great photos! Me too! I can’t get enough of Banana Bread. Thank you so much! Can I use 8.5 x 4.5 pan instead?? Do I need to reduce amount of batter? That is absolutely fine! You don’t need to reduce the batter but maybe you need to bake it a couple of minutes longer. Check with a toothpick.